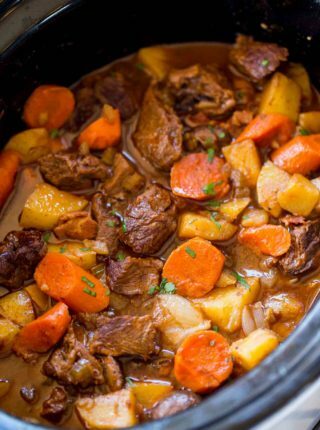 Ultimate Slow Cooker Beef Stew made with chuck roast, Yukon potatoes and carrots for a rich beef stew that is perfect for the cold weather. Slow cooker meals are so popular right now with good reason. We have less time with school and holidays and the weather is so cold we all want food that is hearty and comforting. 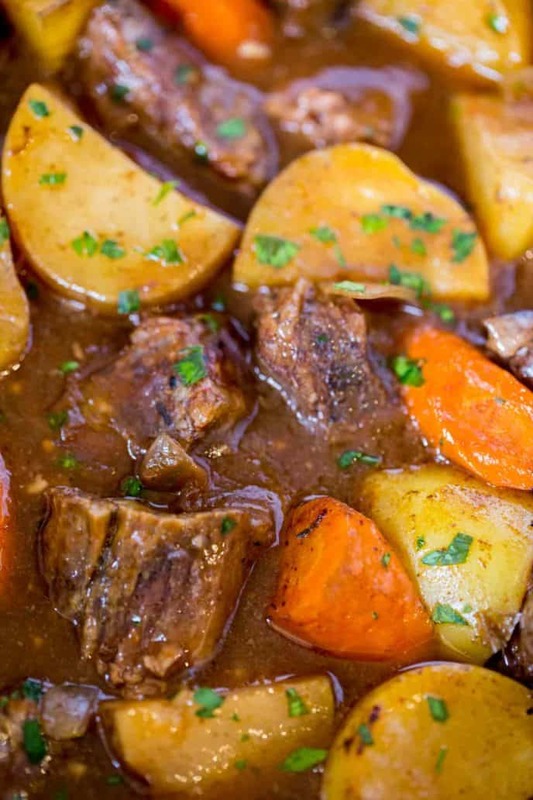 This Ultimate Slow Cooker Beef Stew is the best of all worlds. You can brown the beef and toss it in with the vegetables in 15 minutes in the morning. Then it cooks while you’re gone all day and when you get home you have the most amazing smell going through your kitchen. Serving suggestion? Just like in my Slow Cooker Vegetable Beef Soup I highly suggest you enjoy this meal with crusty French bread and a side salad (a nice lemon/olive oil dressing would be great to cut through all the hearty flavors here). Brown your beef! I used a chuck roast, seared it well on both sides, then trimmed and cut it into 2-3 inch chunks. One of the easiest and most delicious ingredients in this stew: Yukon Potatoes! They’re buttery and rich and won’t fall apart after a long day of cooking. Definitely use these potatoes. I browned the beef in my cast iron skillet and got a GOOD crust on both sides with plenty of kosher salt and black pepper. If you have a slow cooker with an aluminum insert I highly suggest browning it in the insert and saving all the browned flavor that stays in the pan for your stew. Instead of crushed or diced tomatoes I use tomato paste, the concentration of flavors adds so much more. In a stew you aren’t looking for the consistency to be that of a soup, so minimizing added liquids is helpful. If using canned tomatoes instead of paste drain the can. 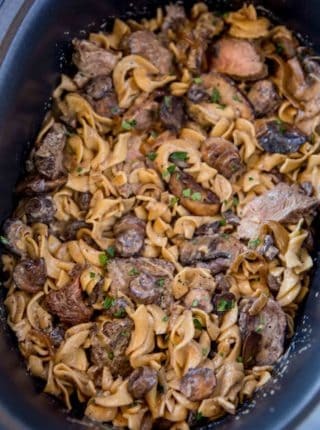 Serve this with crusty french bread, the Beef Stew is great for bread dipping. 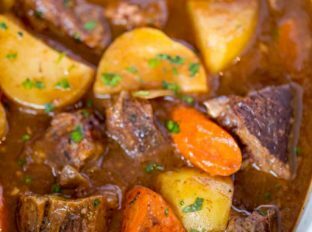 How do you thicken up beef stew? 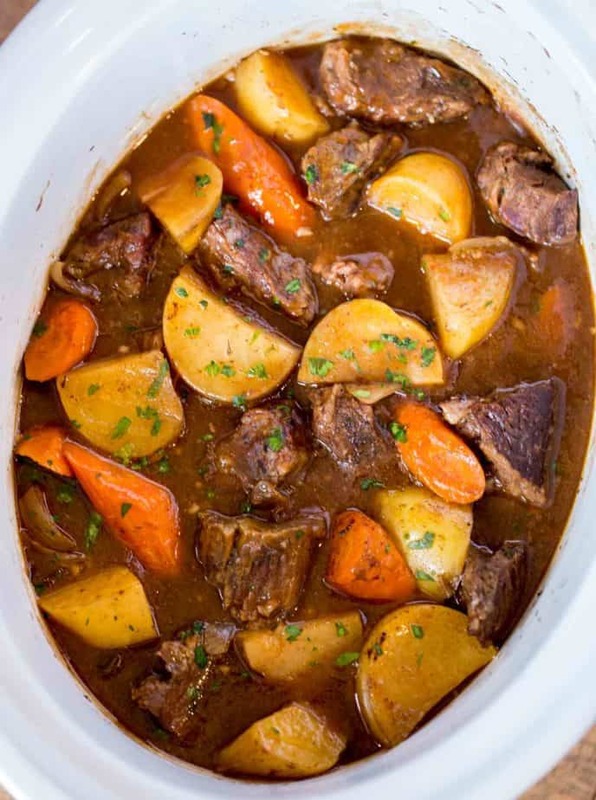 To thicken beef stew you can either mix equal parts of flour/butter together and add it to the last hour of cooking or you can simply mash 3 or 4 chunks of the potatoes well and mix it into the stew for a natural thickener. Slow Cooker Beef Stew with Red Wine? Instead of four cups of beef broth add in 3 cups of broth and one cup of red wine and follow the rest of the recipe as written. Aluminum Insert Slow Cooker: I brown the meat in the insert without losing a bunch of the flavor by transferring the meat and leaving the browned bits behind. If you’re thinking of a new slow cooker, consider it if your budget is open. Preheat an aluminum slow cooker insert or cast iron skillet on high heat. Season the beef with half the salt and all the pepper. Add to the skillet and brown on each side for 4-6 minutes or until deeply browned on each side. Remove the beef from the pan and add in the onions. Cook the onions for 3 minutes, stir then cook another 3 minutes. Into the slow cooker add the onions, carrots, potatoes, broth, second half of the salt, tomato paste, bay leaf, thyme, garlic and Worcestershire sauce. Cut the beef into 2-3 inch chunks and add it to the slow cooker. Stir all the ingredients until well mixed and cook on low for 7 hours. In a small bowl mix the butter and flour and add it to the slow cooker and stir. Cook an additional hour or until thickened. *Alternately use a big scoop of Beef Better than Bouillon like I did in addition to water/stock. The extra beef flavor is fantastic. It was so delicious my husband and I ate it for 2 days in a row!! Definitely sounds like a winner! Would I be able to make this in a Dutch oven? If so, what time and temperature? Thanks! Yes, cook at 325 degrees for 3 hours. Enjoy! If I scale the servings to 2, do I adjust the cooking time? I would err of the side of caution and check it around the 5-6 hour mark but make sure you’re using a smaller slow cooker so the heat distributes properly. Make sure the slow cooker is half to three quarters full. Hope this helps. Made this stew the other day…it was delicious! The meat was super tender, the broth/gravy was so flavorful, and the vegetables were cooked perfectly…not too mushy from cooking for hours. This will be my go-to recipe from now on. Thank you, Sabrina, for all your wonderful recipes! This recipe is DELISH! The flavors were wonderful. I added an extra scoop of beef flavor like the suggestion. Only modification I used was I bought beef cubes and coated them with flour and fried them on each side. I was so excited to try this because it smelled so great in the slow cooker all day. Thank you for sharing this recipe! i usually make beef stew on top of the stove. i looked for some crockpot recipes last week, and yours looked the best. i made it today, eating it now. SO FREAKING DELICIOUS ????. ty! ps, i added some frozen peas the last half hour of cooking ? Loved it! I didn’t add tomato paste, just 1/4 cup of red wine simmered and reduced in the original seared pan. 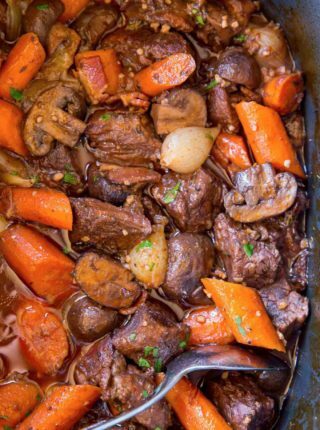 I have made beef stew multiple times and this has to be hands down the very best recipe I have ever tasted!!! I tried this and on low for 4 hours, the potatoes and carrots were not cooked. I suggest on high for most of the time instead. Needless to say, dinner wasn’t ready at 6:30 when I got home. This is just the best beef stew EVER!! 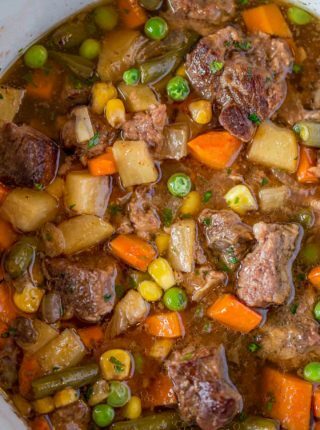 My husband tells our friends ‘no one makes better beef stew than my wife’. No kidding. Found this recipe this morning and plan on making this coming weekend. Seems like cutting the meat in 2-3inch pieces seems awfully large. If I cut into small bit size pieces should I shorten the cooking time? You could always check it around 6 hours in for doneness. I hope you enjoy it! So I cooked this last night on low for atleast 7 hours. This morning my potatoes and beef just seemed under cooked…What else can I do?? Oh no, it sounds like maybe your slow cooker doesn’t run as hot as it should. I would just give it more time, maybe another hour or so. I cant cook to save my life …I just made this and it came out amazing….so easy and delicious…thanks for sharing …added the red wine… ? Yay, I’m so glad you decided to give it a try. Thanks for the 5 stars, Denise! I made this recipe last night and it was delicious. I added a few parsnips and some frozen corn at the end -needed no thickening which was a plus. This is my new favorite stew recipe, beautiful and delicious! I will be honest I make a great beef stew already with red wine blah, blah, blah but I just happened to see your recipe and decided to try it. It came out amazing!!!!! Thank you for such a simple but delicious Sunday Dinner. This stew is hearty and delicious! I would definitely make it again! It might still need around 4-5 hours on high. I just prefer low an slow because I feel like the meat is more tender. Enjoy! Oh no, I’m so sorry that happened. If you followed it to a t, I’m not sure why the taste would be off. If it was overcooked, it sounds like maybe your slow cooker might run hot. If you decide to try again, check it sooner to ensure that doesn’t happen again. Hope this helps! Do I just add a scoop or two of the better than beef boullion to the beef broth? Or is this totally in place of the broth? I use the better than boullion to make the broth and then add an extra scoop or two for a bolder flavor. Hope this helps! Enjoy! Hello! Do you soften or melt the butter before mixing it with the flour for the last step? No, just mash it together and add it to the slow cooker. Enjoy! Made this last night for dinner. I’ve made more than many over the years.. DING DING—WINNER— this one is by far the best flavorful one ever!! Followed all your **sidenotes** and added celery …. excellent ??? 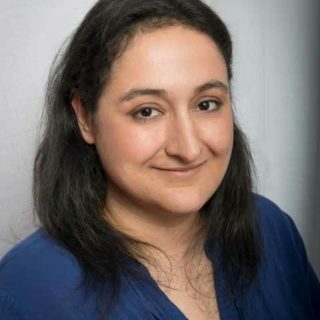 Thanks so much, Diana! I appreciate you taking the time to come back and let me know how much you enjoy it! Looks so delicious I will try this tonight for our dinner…. Great stew! I especially liked cooking the Guinness Stew in my Dutch Oven @ 325 Deg F for 3 hrs. The meat was tender and the stew was perfect consistency! Made this today. Followed recipe exactly ( except i bought stew meet already cut and didnt sear first)and was delicious. My whole family agrees……this recipe is a keeper!!! i feel stupid for asking, but should i melt the butter then add the flour or add the flour to room temp butter or does it matter? i’m probably gonna melt it i guess for ease. kinda like a rue i suppose. You’ll just mash the butter and flour together and add it to the slow cooker, no need to melt it. I hope you enjoyed it! I made this today and even though supper isn’t for a few hours, I tried some….it is absolutely delicious! The only thing I didn’t have was Worcestershire sauce, but I don’t think it made any difference! It has great flavor and the meat is for tender!! I can’t wait to serve up a bowl of this stew for myself!! 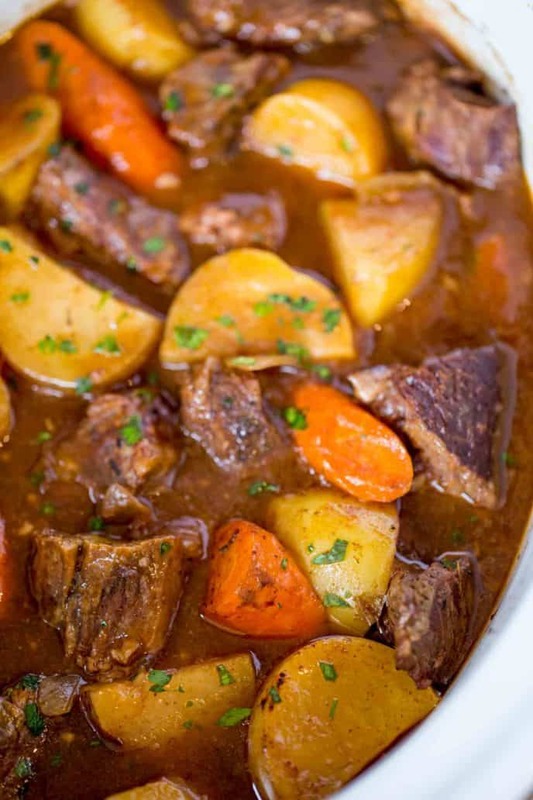 This is one of the best beef stew recipes I have tried. I used 2 pounds of beef stew meat, just because it saves me time to buy it that way, and 8 small red potatoes, cooked for 10 hours on low, then added the butter/flour mixture and cooked another hour. Served over biscuits for an awesome dinner! Thank you so much, Deb! I’m so glad you enjoyed it. Making this right now, it’s been cooking all day just waiting for it to thicken up a bit (the last step). My house smells AMAZING and we can’t wait to eat! PS, I did taste a spoonful before I put the thickner in. So Good! I followed this recipe exactly and it was amazing! I loved it and so did my family. I will definitely be checking out your other recipes (especially the slow cooker ones). Thanks! You’re welcome, Sunny! Thanks for the 5 stars. I’m going to make this today. Did you use a chuck pot roast or a chuck tender roast? Would either one work? Either one will work fine. Enjoy! I am excited to make this! Would there be any complications with adding 8oz or more of sliced Crimini mushrooms? I’m cooking it right now! Thanks for sharing the recipe and I did it with the “suggestion” of the red wine. I forgot the bay leaf, but even without it the recipe was so so so good! It made 6-7 servings.